2. Mix oats, flour, almonds, sugar, and salt in small mixing bowl. 3. Blend applesauce and water in measuring cup with fork or small wire whisk until well mixed. 4. Add applesauce mixture to dry ingredients and mix well. If needed, add small amount of water to hold mixture together. 5. Press into 9-inch pie pan, and bake for 7-9 minutes, or until light brown. Remove from oven. 6. Turn down oven to 350 degrees F.
7. Mix brown sugar substitute, cinnamon, nutmeg, ginger, and salt in bowl. 8. Add egg substitute and vanilla, and mix to blend ingredients. 9. 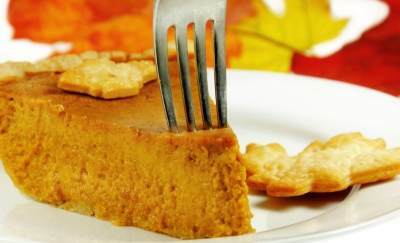 Add pumpkin and fat free evaporated milk, and mix well to combine. 10. Pour filling into prepared pie shell. 11. Bake for 40-50 minutes at 350 degrees F or until knife inserted near center comes out clean.